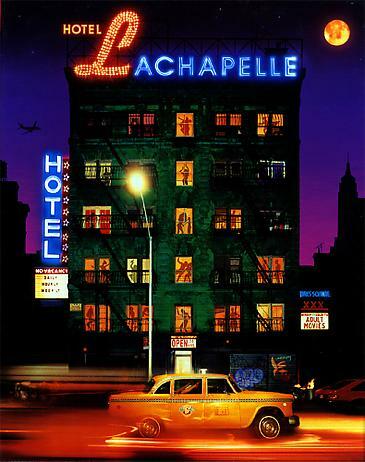 I decided to call this book Hotel LaChapelle because almost all the photos in it were conceived of and made while in hotels. I spend most of my time in hotel rooms. I’ve gotten so used to living in them that I’ve made my apartment look like one so I won’t feel like I am away from home when I actually am home. And when people come for a photo session with me, they are giving themselves over, sort of checking in. When you stay at a hotel you’re living for one day in a place where you don’t normally live. That feeling can be true with photographs, too. The good thing about hotel rooms is the clean sheets. Every day, no matter how dirty you’ve been all day long, you get clean sheets. Coming back to the room at the end of a day for me is like entering a white, pressed womb of forgiveness. There’s a cotton-weave sterility hotel sheets offer that makes all my daily transgressions slip away, annulled. Then I can fall asleep peacefully. Waking up in hotel rooms is another story. Somehow all the possibilities for a clean slate, a fresh new life, which the hotel room promised when you checked in, vanish with the first flicker of the fluorescent bulb in the bathroom. That’s when I look at my green reflection in the mirror and realize I’m about to step into another day.